South African based Nigerian producer, Christopher Tochukwu aka Sisquo recently brought one of his artistes, Dan Lufani aka Dan Lu to Nigeria to collaborate with Nigerian musicians. Dan Lu is from Malawi but based in South Africa and is one of the best male Hip-hop artiste making waves and will collaborate with Kingsley Chinweike Okonkwo aka KCee. Chief Executive Officer of Sisquo Production, Tochukwu from Mbaise in Imo State said that Nigeria is the hub of entertainment in Africa and they are here to tap from her experience and presently we have signed a deal with Five Star Music for the collaboration. Continuing he said, I have Nigerian artistes based in South Africa under my label. 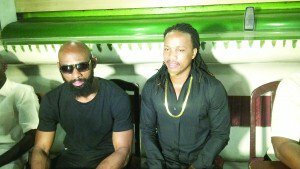 They are Christopher Ogbulu (aka Chris Fly) and Friday Hutchman Joe and are currently making waves in South Africa. I have brought Nollywood artistes to South Africa and shot a movie entitled Whiplash, and I hope to bring the series to Nigeria Nigerians to enjoy and watch. Talking about Piracy, he said: I left Nigeria because of piracy and I was told that before I could sell my music, I have to pay pirates for them to market my music and I told them that I can’t do it and I had to leave Nigeria for South Africa. Piracy in South Africa is not as high like what we have in Nigeria. So far, we have other artistes that we will like to collaborate with and when the right time comes, we will unveil them. Right now, we are focusing on KCEE and things will work out fine. While Dan Lu observed that I am so happy to be in Nigeria and her artistes are the best in Africa and we give them that respect. The music industry is big and it is not easy but with the grace of God, I know that things will work out fine because I believe in God. Despite the challenges, I thank God that we are in Nigeria and we have signed a deal with Five Star Music. Talking about his kind of music, Dan lu said: My music is Afro Pop infused with traditional songs. Music in Malawi is growing and with the coming of Nigerian artistes in Malawi, things are going on well. There are talented Malawian artistes and I believe that they will take Africa by storm. I have four albums to my credit and have shot the music videos as well. I am bringing my style to collaborate with KCEE and we will work together to the change the lives of Nigerians. Although, it is going to be a love song but it is rich in contents. “ I have been with Sisquo Productions for two years now and I know what the record label is doing great and our relationship is cordial. I am a transparent individual and they have shown that they are responsible, and that is why, I was able to sign a deal with them. In Malawi, we have the culture of respecting ourselves and before we release a song, we ensure that the messages will change the lives of people.